Lithuanian rabbi and merchant; born 1746; died in Grodno Jan. 12, 1819. He was the son of R. Eliezer of Urle (Orle), in the government of Grodno, and succeeded his father in that rabbinate. Later he occupied the position of "rosh bet din" at Grodno, where his father had been called as rabbi. Upon his failure to secure the rabbinate of Grodno after the death of his father (1791), Tanḥum engaged in business, in which he was very successful. There is a tradition that he enjoyed the confidence of the last king of Poland and that he was well thought of by Emperor Alexander I. His signature is first under the resolutions adopted by the Jewish delegates who met in Wilna in 1818 to select three deputies to reside permanently in St. Petersburg and represent Jewish affairs before the government (see Jew. Encyc. i. 345, s.v. Alexander I.). 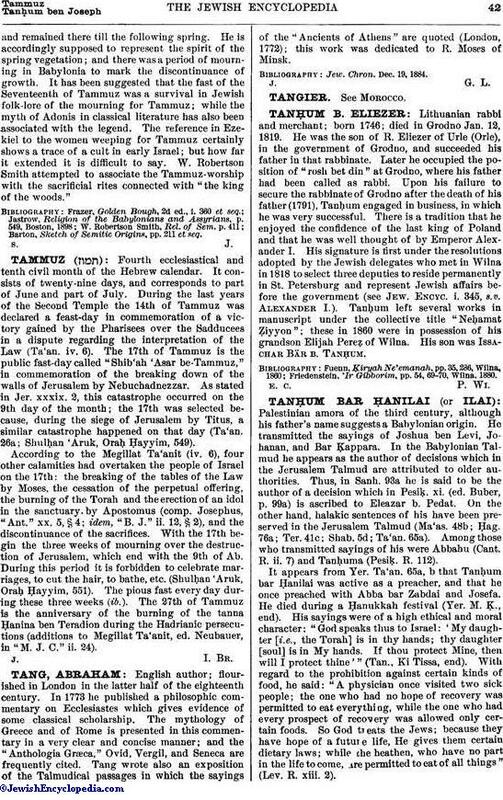 Tanḥum left several works in manuscript under the collective title "Neḥamat Ẓiyyon"; these in 1860 were in possession of his grandson Elijah Pereẓ of Wilna. His son was Issachar Bär b. Tanḥum. Friedenstein, 'Ir Gibborim, pp. 54, 69-70, Wilna, 1880.